On this full-day Portland City and wine-tasting combo tour, you can experience the best that the City of Portland has to offer and explore the amazing Willamette Valley Wineries. On this guided, small-group tour you will visit some of Portland's most famous attractions, such as Pittock Mansion and the International Rose Gardens and enjoy three different wine-tastings at three select local vineyards. This tour includes transport by an air-conditioned Sprinter van. Travel through the various parts of the city from downtown Portland to the Pearl District to Nob Hill, and several neighborhoods. Visit all the must-see attractions including the sites of Pioneer Square and learn about the great diversity found in Portland’s downtown area, the historical importance it has played in the United States' history and the fast-growing culture that exists in the City of Portland. On the morning portion of this tour, learn about many prominent and notable citizens of Oregon. Learn about Portland Food Carts. Next, tour through the Pittock Mansion, a meticulously preserved architectural landmark that symbolizes Portland’s transformation from a small lumber town into a bustling city. As you travel, let the fragrance of the International Rose Gardens embrace you with over 550 different varieties of Roses, and delight your senses with the lush and beautiful Washington Park, featuring some of the most amazing cascade mountain views. Your last stop of the morning is the Lan Su Chinese Garden- one of Portland's greatest treasures and most interesting sites to see while visiting Portland. A result of a collaboration between the cities of Portland and Suzhou, a sister city in China's Jiangsu province that's famous for its beautiful Ming Dynasty gardens, Lan Su was built by Chinese artisans from Suzhou and is the most authentic Chinese garden outside of China. After your morning City Tour, you will be dropped off at the biggest food cart pod in town for lunch (at own expense). Following lunch, you will visit 3 Willamette Valley Wineries! A hub of Oregon wine country, the Willamette Valley is home to more than 700 wineries. 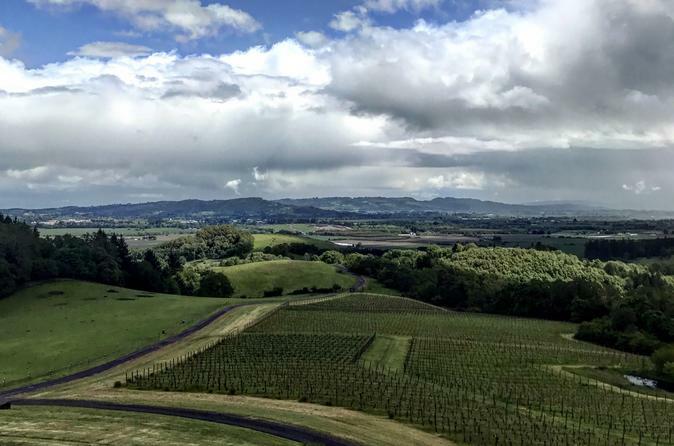 Whether you are in the mood for Pinot Noir or other varieties, looking to experience the ambiance of a hip, metropolitan winery or admire the legacy of a small town vineyard, you can find it in the Willamette Valley. Enjoy three wine tastings at three select local vineyards. Not only are the wines spectacular, so are the views, so don't forget to bring your camera!